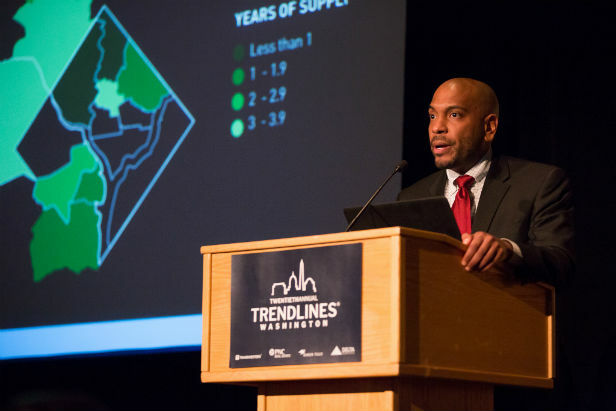 WASHINGTON, DC–Transwestern held its annual TrendLines conference last night in the Ronald Reagan International Trade Center debuting its MegaTrends report and announcing its TrendSetters for the year — EDENS CEO Jodie W. McLean and Jair Lynch Real Estate Partners President and CEO Jair Lynch. Speakers included Sage Policy Group CEO Anirban Basu, Delta Associates President William Rich, and Elizabeth Norton, Director of Research for Transwestern’s Mid-Atlantic region. After years of agonizingly slow recovery, the US housing market is finally regaining a measure of normalcy, the report said. With yields on government bonds so low, many investors continue to deploy capital into commercial real estate associated with ultra-low capitalization rates. In short, investors have not been exiting the market even as capitalization rates have fallen, helping to further cement gains in property values. The question is, the report concludes, whether this cycle of appreciation has gone too far. For nearly five years, the Washington metro has been absorbing new apartment product in greater amounts than the long-term average of 7,000 units per year, however a recent study by the Stephen S. Fuller Institute at George Mason University suggests there is a net migration of younger people leaving the Washington metro. Transwestern doesn’t believe this will have an impact on absorption. “While it’s been in the news lately that there’s a net migration of millennials leaving Washington for more affordable cities with better job prospects, it doesn’t appear that those who rent Class A apartments have packed their bags yet for Austin or Nashville,” said Rich. As financing for larger deals dried up, smaller, boutique projects prevailed in condo development, contributing to the drop in sales activity. This trend could reverse in 2018, as larger-sized projects are slated to start construction. Condo sales in 2018 should be higher than they were in 2017, but a significant increase in the share of condo sales compared to apartment absorption is not anticipated. The tight flex/industrial market condition will lead to rent spikes in select submarkets during the next two years, particularly for close-to-the-core sites. These market conditions will continue for some time as online retail spending shows no sign of slowing down.